Most people think a fridge is a fridge and a freezer is a freezer. Keeping things cold isn't exactly a rocket science is it? But in the competitive commercial world of bio-science, there can be huge investments riding on the speed, dependability and success of research work, R&D and biomedical breakthroughs. This means that's focus on fully monitored, controlled storage of the bio-materials that are crucial to such operations in both commercial bio-science and scientific research, the window of opportunity can be exceedingly limited and the development time frames under heavy scrutiny. High performance refrigeration and freezer equipment is therefore essential for keeping sensitive, delicate material within meticulously controlled storage parameters. And because this bio-material is often in very short supply as well as being inordinately expensive to acquire or develop, you have to able to depend on your bio-storage facilities – absolutely and at all times. 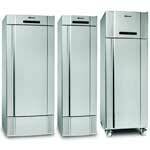 Gram Commercial has therefore applied all its vast range of refrigeration and freezer know0how to providing the ultimate in meticulously controlled, highly dependable bio-storage. Gram Commercial design the Bio-Line range with all the mission-critical components and systems to exceptional specifications, and with every detail super-optimized to tackle the exceptional demands of discerning bio-science customers. Gram Commercial focus on making BioLine cabinets and systems supremely reliable, so you can be sure of keeping delicate, high-value bio-science materials under prefect conditions at all times, with a minimum of effort or concern. Gram BioLine refreigration and freezer solutions are ATEX certified and are the ideal solution for your storage needs.